Last Saturday I had the most delightful surprise at the Boston Paper Collective in Charlestown, MA. I signed up for Aimee Lee's workshop, "Paper like leather, bark like thread: Korean paper techniques", because I had just gotten her book and was loving it. Since I read nothing about the workshop, I assumed it would be about making paper but decided to go even though it is not a particular interest of mine. Turned out the workshop wasn't about making paper at all but about techniques for working with paper that has already been made. We had a busy but relaxed afternoon learning five different techniques. As we worked, Aimee told us wonderful stories as she shared her experiences learning papermaking and these paper techniques in Korea as a Fulbright Fellow. 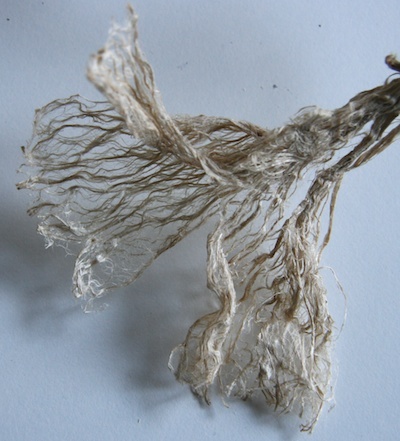 First we worked directly with plant fibers—dak from Korea (kozo is the Japanese equivalent)—that Aimee had prepared. We used awls to tease the fibers apart and make a lace-like surface. We then moved onto working with paper. We started with texturing paper. We used beautiful Eumyangi (moon-sun) paper that Aimee had made in Korea. We crumpled it into a ball, wet it, wrang it out, and then squeezed it tightly together. 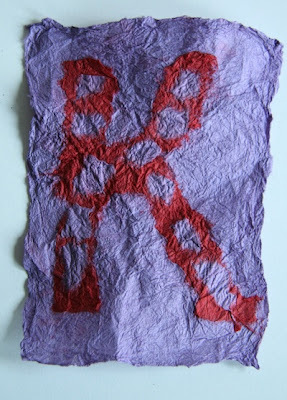 We loosened it by throwing it again the table and then used several techniques to add texture and softness to the paper. It became more fabric-like as we worked. I can see lots of possibilities and am anxious to work with this technique again. We made paper cord by cutting a piece of paper into one long strip (easier than it sounds with Aimee's time saving method) and then wet it and twisted it. 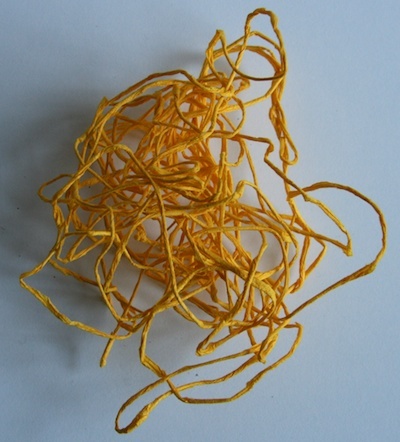 Aimee has used this for knitted books. I'm not sure where it will take me. 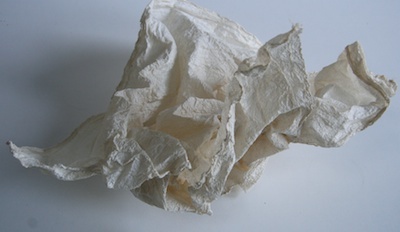 Joomchi is a way of felting paper. We used colored kozo papers Aimee provided. A base sheet was sprayed with water. Smaller pieces were torn, arranged on top, and then sprayed again. 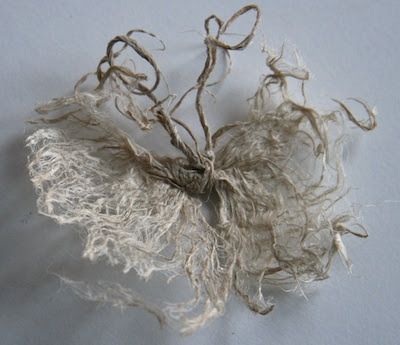 The paper was then crumpled and massaged, opened, and the repeated until the fibers merged. I made the initial K for my daughter Kendra. I do a lot of collage in my classes and love the idea of working without glue. However, joomchi requires papers made with long fibers so my beloved recycled copy paper won't work. 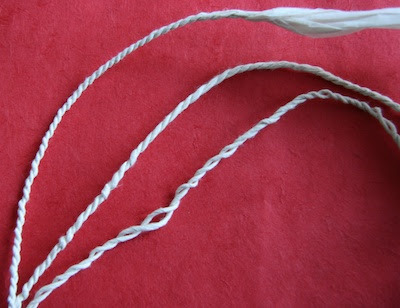 The last thing we made were twisted cords for Jiseung, paper weaving. Aimee showed us a most amazing collection of objects woven from paper. I must say I was daunted by the time and skill required for making the cords, let alone a woven object. By turning two strips of paper in the palm of your hands, you are twisting the individual strips in one direction and twisting the two together in the opposite direction. You can see in the picture of the ones I made where I got confused and started untwisting the two for a while. If you ever have the opportunity, take a workshop with Aimee. In the meantime, check out her book and her website where she has a lot of information about Korean papermaking including videos as well as her own work. P.S. I do know it's Wednesday. a wonderful report, susan. i know from working with aimee how interesting it is to see where hanji can take you. looks like you accomplished quite a bit in this workshop! Love the orange/yellow cord. Would you be willing to share a bit more on how to make that? You must have had a fantastic, fabulous time. Neat!